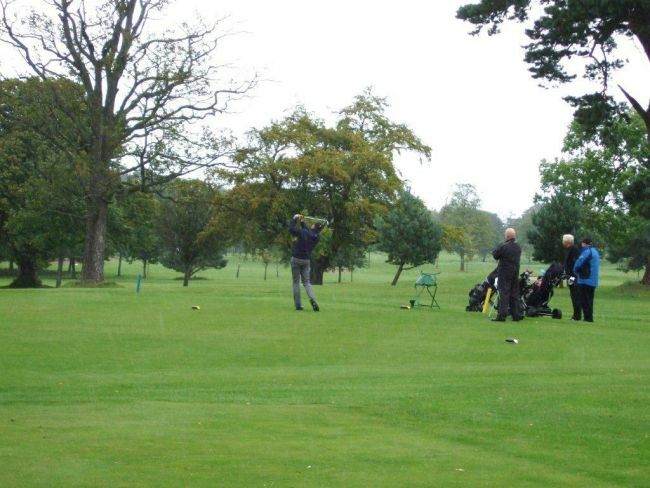 The sixteenth holding of The Sportsman’s Charity Golf Classic was played at Bruntsfield Links Golfing Society, Barnton Avenue, Edinburgh on Friday 21st August 2015. The format for the golf competition was the usual Texas Scramble strokeplay with a “shotgun” start, sixteen teams taking part in thankfully decent weather. Vino Wines, Edinburgh, provided a wide range of welcome sustenance to the golfers at critical points on the course, the North Berwick Gin being especially popular, and we thank them for their support of the event. The team with the winning net score, receiving the traditional hickory maple headed putters supplied by St Andrews Golf Company, Largoward, St Andrews, was The Royal Bank of Scotland, Commercial Banking, Edinburgh, led by Ben Honeyman. They were also the winners in 2014 and this year became the first team in the event to have a gross score under 60, in this case 59. Not very far behind, in second place, was The Misfits, captained by Ron Davidson of PM Solutions, the 2013 winners,Team Valente, being in third place. The winner of the longest drive was Grant Hill, a member of The Royal Bank of Scotland team. This prize is usually won by the player who drives the ball the furthest on the fairway of a given hole but in this case the green on the 8th hole, 345 yards, had to be deemed a part of the fairway as Grant drove it that far. He also holed the putt for an eagle 2. Worthwhile for his team as a 3 would have placed them second and a 4 would have put them in third place in the main competition. Somewhat less dramatically the winner of nearest the pin was Hamish Steedman, St Andrews Golf Company, a member of the Divot Diggers ‘15 team. Following drinks on the terrace on a beautiful evening, an enjoyable dinner was held in the clubhouse after the golf and the players were treated to a very entertaining Q&A session looking at the state of Scottish rugby and the upcoming Rugby World Cup in the company of former Scottish internationals Iain and Kenny Milne and John Rutherford, Kenny and John having captained teams in the golf competition. A prize draw during dinner was followed by a “bottle draw”, again kindly supported by Vino Wines, and a silent auction. The funds raised from the event amounted to £3,200 and will be donated to Scottish Golf Trust. The support provided to the event by all of the teams, Bruntsfield Links Golfing Society, Vino Wines and St Andrews Golf Company, the volunteer helpers and all of those who donated some excellent auction and prize draw items is very much appreciated by the Charity.